Are you interested in joining our team of skaters? Go for it! 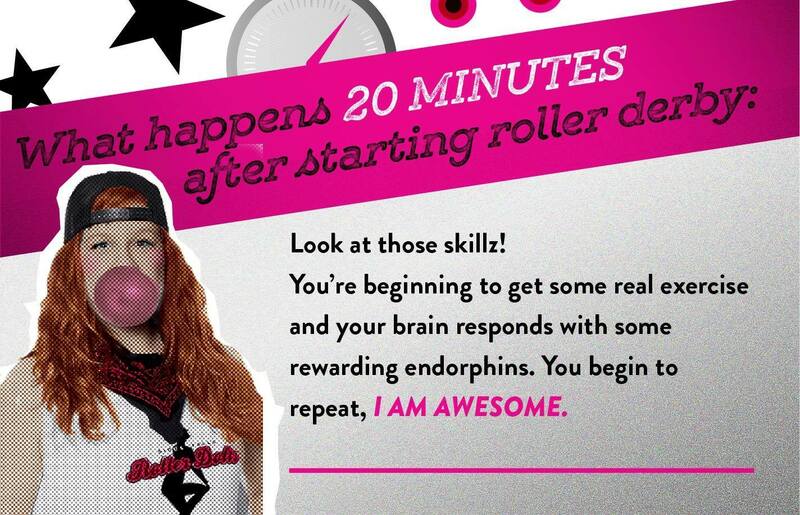 Roller derby has a plethora of benefits for skaters! 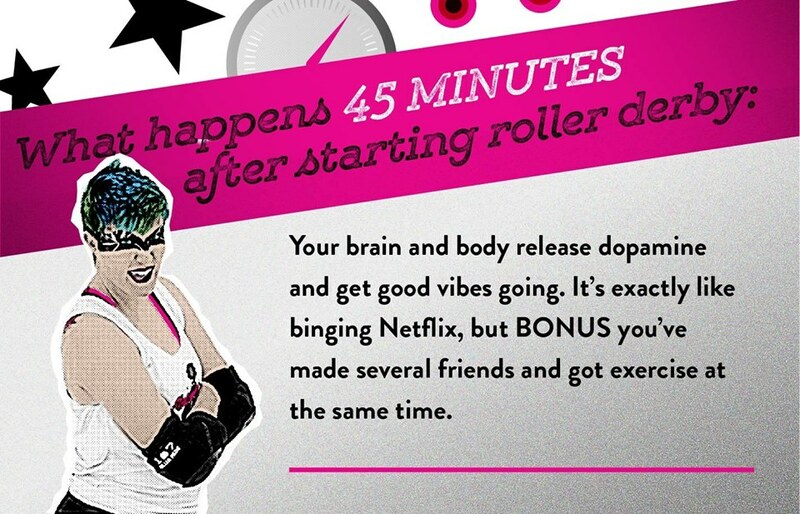 Roller derby requires a lot of practice and fitness. It’s not uncommon for skaters to lose weight when they begin training, but don’t be surprised if you gain some back with all the MUSCLE you’re going to build up. We practice about 5 hours a week, and we strongly encourage skaters to establish a workout routine outside of practice as well. As a team, we help keep each other accountable and can provide ideas for workouts as well. Our practices naturally include a great deal of cardio, but also include strength building both on and off skates. Does that mean you need to be in top physical condition when you begin? Nope. It can make the journey easier for some, but even those in the best shape might struggle with specific skating skills or learning the game strategies and rules. Everyone comes in with their own strengths, so do not think you can’t make it if you aren’t already a gym rat. Many times, women who didn’t do ANY sports before find their athletic niche in derby. Roller derby is a complex sport. There are a lot of moving parts on the track, rules & strategies, quick decisions and reactions… all while being a full contact sport! It’s like playing speed chess while people throw bricks at you. Many skaters find the mental game to be the most fulfilling aspect of the sport. 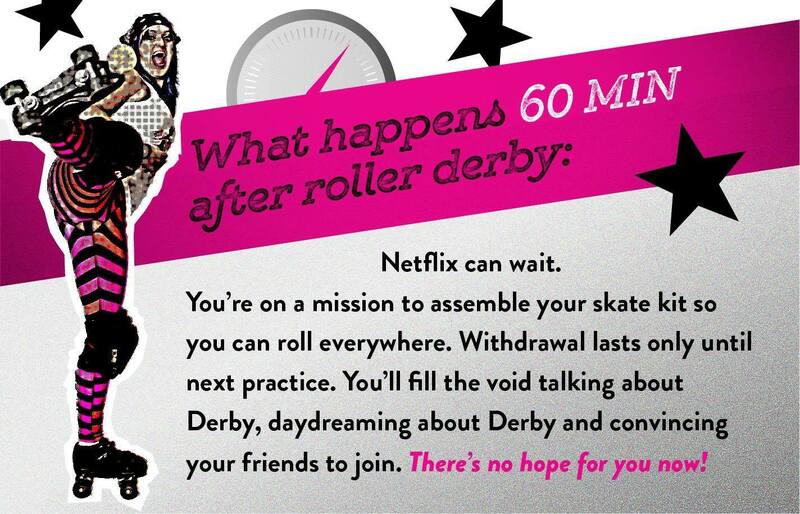 Don’t know anything about derby yet? Don’t worry! During our Fresh Meat program, and beyond, our coaches and veteran skaters teach you everything you need to know! Roller Derby is known for being inclusive and supportive. Your teammates will become like family, your opponents will become your friends! Be prepared, your Facebook friends list is going to explode!!! Derby involves both losing your personal bubble as well as trust… this means teammates are usually a close-knit group. Our team spends a great deal of time together socially as well, ranging from going out for meals or drinks to gatherings at local lakes for Sunday Funday. We have a term in this sport, Derby Love. You’ll often see skaters giving 110% on the track, knocking down their opponents… and then see them hug or high five after. You’ll grow your social network well outside of your team, maybe even develop some really close friendships. Just like the mental game is key for some skaters, the camaraderie is the driving force for others. Still not sure? Maybe you have a few questions? 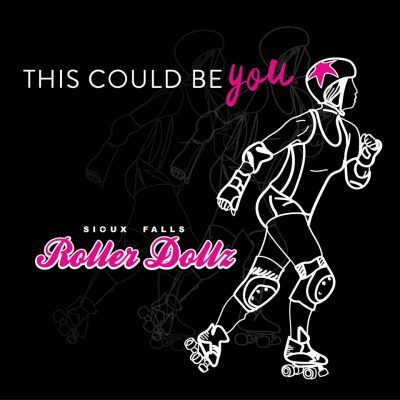 or email us at: beadoll@rollerdollz.com! Thinking you’d like to get involved, but maybe skating isn’t for you?